Spec’s sells a lot of Champagne. In the last 12 months, “a lot” means almost 200,000 bottles which includes only real Champagne from the legally delimited producing region of Champagne France. No bubbly from California or Spain or Italy or even in the rest of France is included. And well over two thirds of that Champagne is labeled Brut Non-Vintage (BNV). Brut Non-Vintage is far and away the best selling sort of Champagne but it is not what gets the most attention. The wine press (and the wine-geek community) is more focused on Rosé, on Farmer Fizz, and on the fancier tête de cuvées or luxury blends (such as Dom Perignon, Le Grande Dame, Perrier-Jouet Belle Epoch (Flower Bottle), Taittinger Comtes de Champagne, and Roederer Cristal). But Brut Non-Vintage is the horse that pulls the Champagne wagon. So, what about the “Non Vintage?” The vast majority of Champagne produced does not carry a vintage date and about 87% of all the real Champagne Spec’s sells is sold without a vintage. Of course this includes a fair amount of Extra dry, Demi-Sec, Sec, and even Rosé but most of it is Brut Non-Vintage. So what is Non-Vintage? To be precise, Non-Vintage Champagne should be and maybe usually is a blend of wines from two or more years that ideally combine the freshness of some younger wines (the majority of the blend) with a smaller percentage of older “reserve wines” that should add richness and complexity while expressing a house style. In practice, a goodly amount of Non-Vintage Champagne is actually to product of a single vintage – especially in the better years. Right now, much of the BNV in the market seems to be based on the 2005 and 2006 vintages. 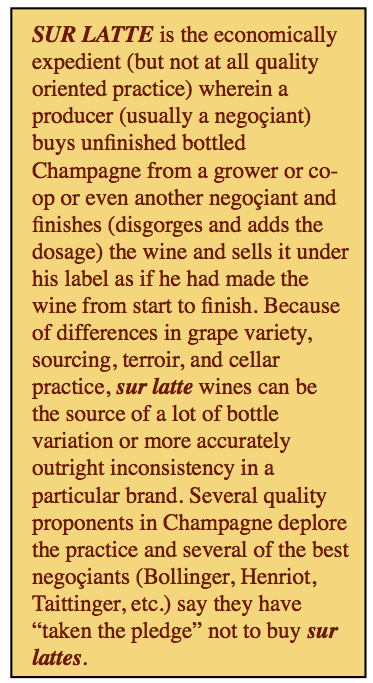 “Seems to be” because the Champagne producers are often more than a bit vague about their tech specs. So why label it “Non-Vintage” (or just sold without a vintage date)? Because most of the Champagne houses large or small use their BNV as the foundation for their business and I find that, at least in the better producers (and certainly the ones that refrain from purchasing sur lattes – please see box), BNV can be the best expression of a house style. The Champenoise want their Brut Non-Vintage to be as consistent as possible and to be the flag-bearing product that is always available in the market. Not all Brut Non-Vintage is the same. Each house has its own style and blend and dosage and other quirks. Here are some of the best BNV Champagnes I have tasted of late. Within the realm of BNV, this is the good stuff. The list is divided into Grand Marques (the bigger and some not so big names), the Growers (small farmer fizz estate bottles of Champagne), and “Super BNV” (which are non vintage “luxury cuvee” wines). Prices are Spec’s “cash” per 750ml. Scores and comments are mine. These are the big and bigger names but I am leaving out the two biggest (Moet and Clicquot) names in BNV because they are too inconsistent in style and quality. GOSSET Brut Excellence, Champagne, NV ($37.79) 45% Pinot Noir and 36% Chardonnay (primarily from grand cru and 1er cru vineyards) and 19% Pinot Meunier. The base blend comes from three harvests and then adds 20% reserve wines. 30 months en tirage. BS: 93. PERRIER-JOUET Grand Brut, Champagne, NV ($39.89) 40% Pinot Noir, 40% Pinot Meunier and 20% Chardonnay with plus or minus 15% reserve wines from previous vintages. Dosage of 11 grams per liter. BS: 92. LAURENT PERRIER Brut LP, Champagne, NV ($41.69) 50% Chardonnay, 35% Pinot Noir, 15% Pinot Meunier; 48 months en tirage. BS: 93. HENRIOT Brut Souverain, Champagne, NV ($42.74) 40% Chardonnay from the Cote de Blancs and 60% Pinot Noir from the Montagne de Reims. BS: 92. DELAMOTTE “Le Mesnil” Brut, Champagne, NV ($37.99) 50% Chardonnay, 30% Pinot Noir, and 20% Pinot Meunier with all of the Chardonnay and Pinot Noir grapes coming from Grand Cru vineyards; 3 years en tirage; aperitif style. BS: 93+. BOLLINGER Special Cuvee Brut, Champagne, NV ($52.99) 60% Pinot Noir, 25% Chardonnay, 15% Pinot Meunier. 20% reserve wines; 0.8 RS; primary fermentation in oak barrels and small stainless steel tanks. 36 months en tirage. BS: 93+. DUVAL-LEROY Brut, Champagne, NV ($37.99) 60% Pinot Noir, 30% Pinot Meunier, and 10% Chardonnay from fifteen crus and generous quantity of reserve wines, full malolactic fermentation. 75% from 2008 and 25% 2006 before addition of 20% reserve wines. Dosage is .8 BS: 91+. COLLET Brut, Champagne, NV ($42.74) About 50% Pinot Meunier with 20% Chardonnay and 30% Pinot Noir; 33% Reserve wines; 36 months en tirage. BS: 91. PANNIER Brut Tradition, Champagne, NV ($27.54) Co-op made (but in a very good co-op), 40% Chardonnay, 30% Pinot Noir, 30% Pinot Meunier; 25% reserve wines. BS: 90+. G.H. MUMM Cordon Rouge Brut, Champagne, NV ($37.79) 45% Pinot Noir, 24% Pinot Meunier, and 30% Chardonnay, 36 months en tirage, 1% Residual Sugar after dosage. BS: 91. CHARLES HEIDSIECK Brut Reserve, Champagne, NV ($48.79) 35% Pinot Noir, 30%, Chardonnay, 35%, Pinot Meunier; 35% Reserve Wines; 36 months en tirage BS: 93. RUINART Blanc de Blancs Brut, Champagne, NV ($66.49) 100% premier cru Chardonnay mostly from Reims with a bit from Ay. BS: 94. LOUIS SACY Brut Originel (67%), Champagne, NV ($28.49) 67% Pinot Noir with 30% Chardonnay and 3% Pinot Meunier. BS: 90+. CHARLES de CAZANOVE Brut 1er Cru, Champagne, NV ($37.99) 50% Pinot Noir, 50% Chardonnay. BS: 91+. POMMERY Brut Royal, Champagne, NV ($36.69) 1/3 Chardonnay with 2/3 Pinot Noir and Pinot Meunier; aged 3 years en tirage; fine food Champagne. BS: 92. J.P. MARNIQUET Brut Tradition, Champagne, NV ($29.99) 50% Pinot Meunier (that is a LOT of Pinot Meunier), 35% Chardonnay, and 15% Pinot Noir, 36 months en tirage, 0.9 RS. BS: 92. BONNAIRE Brut Tradition, Champagne, NV ($34.19) 40% Chardonnay from Cramant, 30% Pinot Noir Bergères-Les-Vertus, 30% Pinot Meunier from Fossoy; 15% reserve wines; 24 months en tirage. BS: 91+. BONNAIRE Brut Variance, Champagne, NV ($39.89) 100% Chardonnay from Cramant (Grand Cru) and Bergères-Les-Vertus (Premier Cru); 60 months en tirage. BS: 94. PASCAL DOQUET Blanc de Blancs Grand Cru Mesnil Sur Oger, CHAMPAGNE, NV ($52.99) 100% Chardonnay from a great grand cru vineyard. BS: 95. PASCAL DOQUET Blanc de Blancs Grand Cru, Champagne, NV ($44.59) 100% Chardonnay from Vertus. 30+% barrel fermented. BS: 92+. JEAN LAURENT Blanc de Noirs Brut, Champagne, NV ($44.64) 100% Pinot Noir; super food Champagne. BS: 92+. JOSE DHONDT Blanc de Blancs, Champagne, NV ($47.14) 100% Chardonnay grown in the Cote de Blancs chalk, 25-45 year vines trained on three canes, no ML. Aperitif style. BS: 93. LAMIABLE BRUT, Champagne, NV ($46.99) 80% Pinot Noir, 20% Chardonnay; all grand cru. BS: 92. These are really tete de cuvee (luxury cuvee) Champagnes but they are also non-vintage by virtue of their use of reserve wines. BARONS de ROTHSCHILD Brut, Champagne, NV ($94.99) 60% Chardonnay from the Cotes de Blancs and 40% Pinot Noir from Verzenay, Ay, Mareuilsur- Ay and Bouzy (all grand and premier cru); 40% reserve wines 36 months en tirage. BS: 94. KRUG Grand Cuvee, Champagne, NV ($140.59) An unspecified blend of Pinot Noir, Chardonnay, and Pinot Meunier, possibly dozens of wines sourced from 6 to 10 vintages that, after blending and second fermentation, is aged another 6 years en tirage. The complete, real-deal, specific tech info is unavailable. But, after drinking the wine, I don’t really care all that much. BS: 95+.